Apollo 14 Moonwalker, Edgar Mitchell, who was a UFO enthusiast and believed there really were aliens at Roswell, has died at the age of 85 following a long illness. His daughter, former West Palm Beach City Commissioner Kimberly Mitchell, was quoted by Palm Beach Post as saying he passed away at a local hospital at 10pm ET on Thursday. Mr. Mitchell lived in Lake Worth, a city in Palm Beach County, Florida. He was the sixth person to set foot on the Moon. He formed part of a 3-man crew, alongside Stuart Roosa (1933-1994) and Alan Shepard Jr (1923-1998). The 1971 Apollo 14 space mission was the 8th manned mission in the US Apollo programme. Mr. Mitchell, who was the lunar module pilot for the mission, spent nine hours working on the surface of the Moon in the Fra Mauro Highlands region. Mitchell said he was pretty sure that within the many thousands of UFO sightings recorded since the 1940s, a considerable percentage were authentic, i.e. he believed Earth has been visited by advanced civilizations from other planets. During an NBC interview in 1996, Mitchell said he had met officials from three different nations who claimed to have had personal encounters with aliens (extraterrestrials). In his opinion, such contacts with aliens ‘was very strong’ and ‘classified’ by governments. He believed the US government had covered up details on what really happened at Roswell, New Mexico. In his book – The Way of the Explorer – he wrote that UFOs probably provided the US government with ‘sonic engineering secrets’. He added that a ‘cabal of insiders’ in the American government were examining alien corpses that had been recovered. He claimed that this group had stopped briefing the country’s head of state since John F. Kennedy was President. In an interview with Nick Margerrison on Kerrang Radio in July, 2008, Mitchell claimed that aliens had contacted humans many times and that the Roswell crash involved a flying vessel with extraterrestrials inside. Governments have been hiding the truth for over sixty years, he added. NASA responded to his claim saying it does not track UFOs and is not involved in any kind of cover-up regarding extraterrestrial life. In the same year, he told Fox News that his comments in the Kerrang Radio show did not involve NASA. He quoted unnamed sources who had since died who told him that the Roswell incident did involve an extraterrestrial craft. He said an unnamed Pentagon officer confirmed this with him. “White Sands (US Army missile range) was a testing ground for atomic weapons – and that’s what the extraterrestrials were interested in. They wanted to know about our military capabilities. My own experience talking to people has made it clear the ETs had been attempting to keep us from going to war and help create peace on Earth. Edgar D. Mitchell was born Sept. 17, 1930 in Hereford, Texas, and considered Artesia, N.M., his hometown. – 1952: he graduated with a B.S. in Industrial Management from Carnegie Mellon. – 1961: he graduated with a B.S. in Aeronautics from the US Naval Postgraduate School. – 1964: he complete his doctorate in Aeronautics and Astronautics at the Massachusetts Institute of Technology (MIT). He was a member of the support crew for Apollo 9, and was also backup lunar module pilot for Apollo 10. He worked at the Johnson Space Center in the lunar module simulator during Apollo 13, and developed procedures that would bring the crew of that crippled spacecraft home. Mitchell had lived in Palm Beach County in Florida since 1975. He is survived by his four daughters, Mary Beth Johnson, Kimberly Mitchell, Karlyn Mitchell, Elizabeth Kendall; two sons, Adam Mitchell and Paul Mitchell; and 9 grandchildren. Visit our UFO and Aliens webpage, where all our related articles are listed. 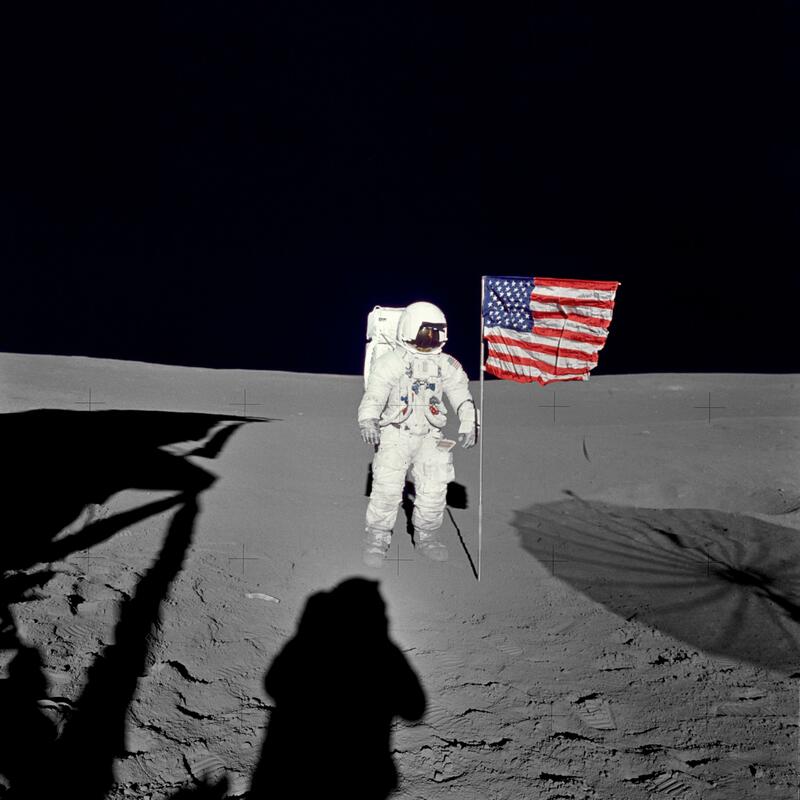 Edgar Mitchell’s death occurred on the eve of the 45th anniversary of his landing on the Moon aboard the lunar module Antares with Apollo 14 Commander Alan Shepard.